The women\xCDs short sleeve v-neck shirt will keep you cool and comfortable wherever the day takes you. Dr. Cool uses a patented chemical-free cooling material designed by Coolcore that keeps you comfortable, dry and cool whether you\xCDre in the yoga studio or on a long run. The surface temperature of the women\xCDs short sleeve v-neck is reduced by up to 30% because the chemical-free moisture and sweat activated material provides three distinct functions _ wicking, moisture circulation, and regulated evaporation. Unlike other workout shirts Dr. Cool is chemical-free, so the cooling benefit never washes out. Main body fabric provides UPF 50 sun protection. Metallic logo heatseal at bottom right hem. 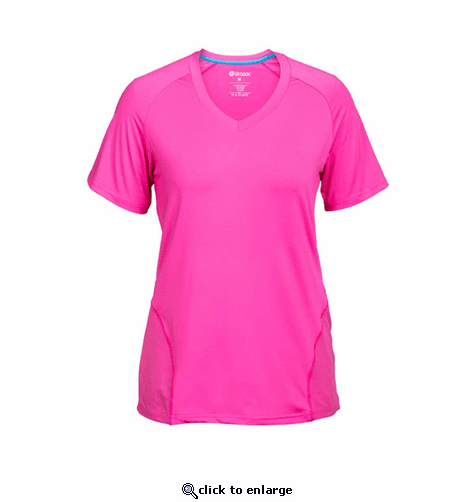 Whether you\xCDre running, hiking, cycling, doing crossfit, playing tennis, golfing, or wearing this as a yoga shirt the women\xCDs short sleeve v-neck provides chemical-free cooling to keep you comfortable and dry. The street-friendly style can easily transition from workout shirt to out and about.